Wives and career coaches have at least one challenge in common: A study by PsychTests.com using their Coachability Test reveals that men are less willing to take direction and criticism. Coaching is just a means to bring out your full potential, and is in no way a sign that you are incompetent. Executive coaching is a serious business. 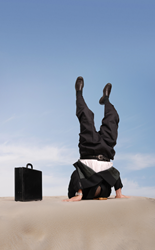 U.S. companies are spending more than one billion every year on coaching services. So one would hope that all employees would be open to the idea of receiving this type of guidance, but research from PsychTests performed with their Coachability Test reveals that male employees may prove to be a challenge. Athletes understand the importance of listening to a coach. Even the “prima donnas” of the sports world know that not heeding a coach’s instruction could translate into trouble, or at least less playing time. Putting ego aside and swallowing pride is necessary when receiving feedback or coaching, whether in the sports or business world. The problem is that a lot of people are unwilling to accept guidance from others – and according to data from PsychTests, this applies to men in particular. 2% of women vs. 7% of men believe that they don’t have any weaknesses. 3% of women vs. 10% of men think that performance evaluations are a waste of time, because they are already good at what they do. 5% of women vs.11% of men will immediately shut down and stop listening as soon as they hear a negative comment about their work. (This is why nagging is a waste of time). 7% of women vs. 16% of men admit that they exaggerate or over-estimate their professional skills. 9% of women vs. 22% of men believe that they are much more knowledgeable than most people. 10% of women vs. 25% of men believe that there is no point in pursuing a goal if you need other people’s help to achieve it. 19% of women vs. 27% of men don’t like admitting to others when they are having difficulty understand something, or are unfamiliar with the topic of conversation. 85% of women vs. 79% of men are open to advice and suggestions from their manager. If asked to list their faults, 10% of women and15% of men would have a hard time coming up with any. 5% of women vs.12% of men threatened to quit after a performance review. 5% of women vs. 10% of men actually quit after a performance review. 13% of women vs. 30% of men told the critic that he/she is “wrong” or “misinformed”. 25% of women vs. 34% of men agreed to improve/implement changes but never followed through. 27% of women vs. 41% of men openly disagreed with the feedback they received. “Because men feel like they can do anything on their own without the help of a coach or anyone else. Just like if a wife asks her husband to call a plumber to fix the toilet – he’s most likely going to try fixing it himself before calling for help, just like getting directions and just like being coached. They feel powerless when they’re being coached; like they’re being molded into an image, or are inferior to the coach…which is why they tend to act out and say, ‘I know how to do it’ or ‘I know what I’m doing’. They don’t want to feel useless or inferior which makes them hard to coach because men are know-it-alls. We want to feel like we’re in control. We’re afraid of having our manhood taken away.” -Dario, 24 years old. “Perhaps because traditionally men view a need for help (or improvement) as weakness. Same reason they don't like to ask for directions.” -Tom, 52 years old. When it comes to coaching, women are more willing than men to accept criticism and guidance.Many men don’t like asking for directions – or taking direction, for that matter. 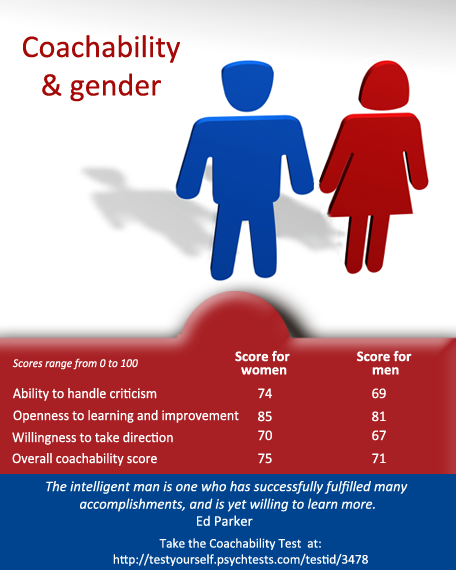 A study by PsychTests indicates that women are more open to coaching, feedback, and guidance than men.